My breath whooshes out, sending a cascade of bubbles toward the water’s surface. One of the passing sharks turns and cruises toward me, mouth agape in an exceedingly toothy grin. He’s so close I could touch him—if it weren’t for the mesh barrier. When he loses interest I swim over to a window, where my next exhalation draws the attention of a family dining at a table six inches from the thick glass. The kids point and wave, and the father raises his glass of wine to toast me. At the sight of food, my stomach gives a hungry rumble, so I head for the surface and shed the scuba gear. In minutes I’m back in my street clothes and feeling a bit like a character in a James Bond movie as I stroll among the visitors at Epcot’s six-million-gallon indoor aquarium. It’s a forgivable fantasy. For $175, any certified diver can go “backstage” to spend bottom time in the tank with more than 65 species of marine life, including protected species of sharks, sea turtles and eagle rays. For $140, non-divers can have a similar experience on the Living Seas Aqua Tour, using scuba-assisted snorkeling gear. As a well-traveled diver, I did this as a lark and was impressed at the quality of the marine environment and the expert handling of the concession by the aquarium staff. 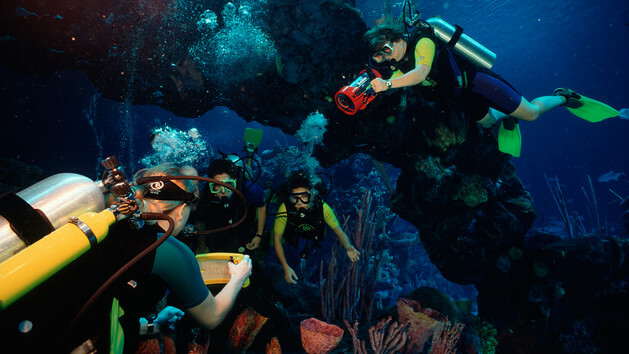 Epcot’s DiveQuest is just one of the activities that appeal to grown-up visitors. Once you’ve seen some of the other choices, you may never look at Orlando the same way again. Established in the 1800s and named for a U.S. soldier felled by a Seminole arrow, Orlando has gone through boom times spurred by railroads, real estate, citrus, and the Space Age in the 1950s, when Cape Canaveral/Cape Kennedy was created. The 1970s ushered in Walt Disney World, the first step toward the city’s becoming the world’s most popular theme park destination. Today it ranks fourth among U.S. cities for foreign visitors and is number one for American vacationers. Like almost every other aspect of life in the U.S., Orlando has been influenced by Baby Boomers who enjoyed the theme parks as children and have returned again and again with their offspring and grandkids. Orlando has matured with them, and continues to develop incentives for adults to visit—with or without youngsters. SeaWorld takes critter encounters to a new level in its Discovery Cove, a tropical sanctuary across the road from the main park. It’s a family attraction, but decidedly adult-friendly. Visitors are limited to 1,000 a day—by reservation–and pay an all-inclusive price that includes all meals, beverages and gear. You can leave your wallet, street clothes and shoes in a locker and spend the day swimming with dolphins, snorkeling with stingrays, hand-feeding free-flying exotic birds, and other unique animal interactions. One package includes camping overnight on the beach next to the dolphin lagoon, and helping with feeding and other behind-the-scenes activities. SeaWorld also offers an all-day Marine Mammal Keeper program in which participants interact with sea lions, beluga whales, dolphins and walruses. On terra firma, special programs at Disney’s Epcot Center reveal the art, architecture and costumes of each country’s pavilion in the Hidden Treasures of the World Showcase; and share the secrets of the park’s gardeners in the Gardens of the World tour. Backstage at Future World you can learn how Walt Disney’s desire to improve the world led to the creation of the park. During the Backstage Safari (a three-hour walking tour) in Disney’s Animal Kingdom, animal specialists show how they care for the park’s exotic animals. Take it a step further and book a room at the Animal Kingdom Lodge, where your balcony will overlook a savannah where 200 African mammals, including giraffes, zebras and gazelles, roam freely. The furnishings and art in the lodge rooms, lobbies, restaurants and shops are all imported from Africa. Less exotic, but also less attainable than an African safari is doing laps behind the wheel of a NASCAR race car. Not so fast! It happens every day at the Walt Disney World Speedway’s Richard Petty Driving Experience. First you don a jumpsuit and ride around the track in a van to learn the key points of negotiating the oval in a real NASCAR vehicle. Then it’s time to put on your helmet, climb through the window into the driver’s seat and wait for the steering wheel and safety harness to be secured by your pit crew. When your engine fires, you follow the pace car onto the track. Every time you catch up with the pace car, the driver will accelerate. If going solo is too much for you, ride along with an experienced driver on a tour at 145 mph-plus. Not edgy enough? An unforgettable adrenalin high lies an hour’s drive east of Orlando at the Kennedy Space Center. Most Baby Boomers grew up with glimpses of this top secret facility on television during the shuttle launches that became milestones of America’s space exploration. Now visitors can indulge their fantasies in the Astronaut Training Experience, which includes time on a gravity trainer chair and at the controls of a full-scale shuttle mock-up—under the guidance of an actual NASA astronaut. More timid souls can take tours of restricted areas, visit the space museum and have a lunch-time briefing with an astronaut. If you have always yearned to skip to the head of the line or go through doors marked “restricted,” here’s your chance. Universal Orlando Resort offers VIP tours at its two parks, Islands of Adventure and Universal Studios, with front-of-the-line access, plus insider secrets behind the creation and operation of rides. One package involves two days, two parks. If you’re not an adrenalin junkie, Orlando has many activities with no fear factors—movies and concerts in the park; opera and ballet performances; and serene gardens, galleries and museums, The city’s Orlandoinfo.com site lists visual and performing arts; history and heritage; parks, zoos and gardens; and recreation venues. And great dining. Duck on the Menu? Never! After a day in the parks, we hustled over to the Peabody Orlando Hotel. We were booked for two nights in rooms with what may be the world’s most comfortable beds (called Peabody Dream Beds) and access to the private Peabody Club for quick breakfasts, hors doeuvres and cocktails. But our apres’ golf attention was focused on lunch in the hotel’s unique B-Line Diner. The 50s-era eatery is a stunningly accurate time-warp, right down to the chrome-trimmed counter and booths, apron-clad cooks and waitresses, and be-bop classics pouring from a jukebox. The burgers and sandwiches are much better than any I had in the diners of old. At cocktail time we joined other guests near the lobby fountain for the afternoon march of the famous Peabody ducks. 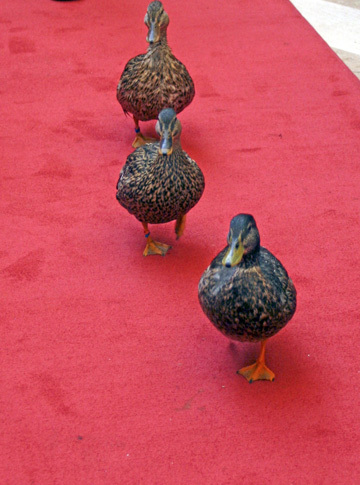 Shortly before 5 p.m. the red-jacketed duck master unfurled a long red carpet across the marble floor to the elevator. When John Phillip Sousa’s “King Cotton March” began, five mallards waddled down steps from the fountain where they’d spent the day, and strode calmly along the spectator-lined carpet and onto the elevator that took them to their well-appointed pen near the fourth-floor tennis courts. The 11 a.m. and 5 p.m. ritual has taken place in Peabody Hotels since the 1930s. That evening, as we settled into our seats at the hotel’s Capriccio Grill, we anxiously checked the menu. No duck, not ever, our waitress assured us. The elegant Italian steakhouse does have melt-in-your mouth prime steaks and chops, and seafood delivered fresh daily. After a heaping mussel appetizer, I hardly had room for the perfectly done beef filet and wine from the award-winning wine cellar. Orlando is perhaps as well know for its dining choices as for its theme parks. Every conceivable type of cuisine and setting can be found here. The buffalo steak at the Gaylord Palms Hotel’s Hickory Steakhouse was a memorable meal. Unforgettable, too, were the African-spiced meals and fine South African wines at Jiko, the upscale restaurant at Disney’s Animal Kingdom Lodge. I have to admit that I also loved sipping a beer and gnawing on a smoked turkey leg from a concession stand during the nightly fireworks show over Disney’s Cinderella Castle. It’s quintessential Orlando. Oh, yeah, about the golf courses. Here’s a few of the more than 160 layouts in the area.